Around the world, desert biomes and other brutally hot climates seem unbearable to humans accustomed to air conditioning, cars and other conveniences of modern life. Evolution is smart, though, and animals indigenous to desert and tropical climes feature all sorts of adaptations that help them pull through in the heat and with scarce water. Most critters have a variety of tricks to survive this sort of hostile environment. Many animals survive the heat primarily by avoiding it. Being crepuscular or nocturnal is a basic way of doing so. Crepuscular animals, like bobcats for example, are active during cooler twilight hours; nocturnal animals, like coyotes, are active during the nighttime. These animals don't have to deal with being active when heat peaks during the day. Another good way of avoiding the heat is burrowing underground. For example, kangaroo rats and other desert rodents dig themselves underground homes. This keeps them out of the sun, and temperatures below the surface are considerably lower than above it. Many animals indigenous to hot climates have simply adapted to tolerate higher body temperatures than others found in cooler biomes. For example, the antelope squirrel can tolerate a body temperature of more than 104 degrees Fahrenheit; that's bordering on a dangerous fever for a human. Many animals that face dangerously high temperatures have adapted to better conduct heat off their bodies. Some birds, for example, can decrease the insulation provided by their feathers. Other animals feature a high ratio of bodily surface area to volume for maximum heat release. Long appendages, like the almost comically elongated ears on jackrabbits, provide such benefits, for example. Water is scarce in desert environments, so animals that live there have adapted to run on very little. Some, like gila monsters, store water in fatty deposits for slow, long-term use. Camel humps aren't for storing water, though; these fat deposits help them go without food for extended periods. 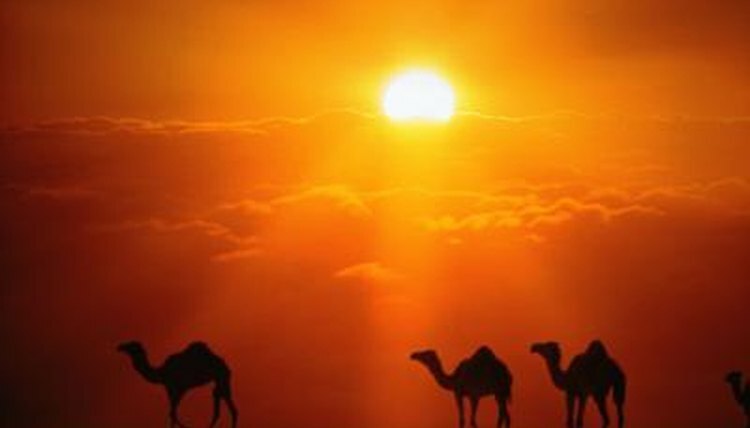 However, camels and other animals in hot climates minimize water loss by sweating, urinating and defecating very little. Estivation is a form of torpor like hibernation, its equivalent adaptation for cold weather. Many animals in hot climates lower their body temperature and with it their metabolic rate, entering an almost dormant state. They become inactive, reducing their response to the heat and their water loss through perspiration, breathing and relieving themselves.